Prospect Park Alliance has removed three trees to date that succumbed to this infestation, located along the Ocean Avenue perimeter of the Park, and additional affected trees in this area will be removed over the winter. NYC Parks, DEC, DAM and Prospect Park Alliance are taking immediate action to limit the spread of infestation and protect New York City's more than 51,000 ash trees. "The Emerald Ash Borer infestation was detected in Prospect Park thanks to vigilant monitoring of the tree population by Prospect Park Alliance arborists, a year-round tree crew committed to the protection and preservation of the Park's 30,000 trees," said John Jordan, Director of Landscape Management for Prospect Park Alliance. "The Alliance will continue to monitor ash trees in the Park, and will work closely with New York City Parks Department, USDA and DEC to continue tracking and responding to this infestation." EAB is a non-native species of beetle whose larvae kill trees by burrowing into the inner bark and thus interrupting the circulation of water and vital nutrients. EAB-infested trees are characterized by thin crowns, sprouts on the trunks of the trees, and the signature d-shaped exit holes adult beetles leave on trees' bark. EAB only affects ash trees, which constitute roughly three percent of NYC's street trees. EAB has been present in New York State since 2009. Governor Andrew M. Cuomo recently awarded a $75,000 Urban Forestry Grant to the Prospect Park Alliance to conduct a tree inventory of Prospect Park. The inventory will include an estimated 12,000 to 15,000 trees in the landscaped areas of the park, representing about half of the total population. The tree inventory will include an invasive insect, pest, and disease detection survey by incorporating the USDA Forest Service early pest detection protocol (IPED). Thank you to Jessica Katz who posted this to several NYC gardening groups, which is how I learned of it. 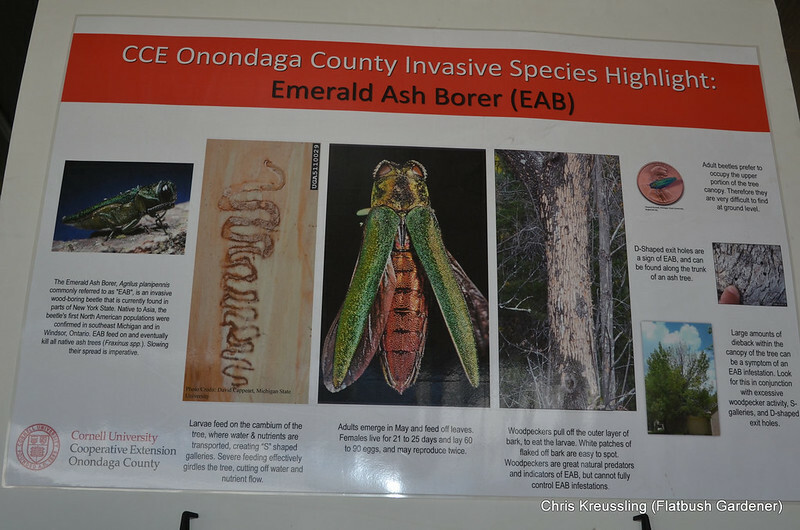 Exhibit on Agrilus planipennis, emerald ash borer, from the Onondaga County Cornell Cooperative Extension at the 2012 New York State Fair.